The Amsler grid is a tool used during an annual comprehensive eye exam that eye doctors use to detect vision problems resulting from damage to the macula (the central part of the retina) or the optic nerve. The damage may be caused by macular degeneration or other eye diseases, so the Amsler grid is useful in detecting these problems. If you are at risk for macular degeneration or other eye diseases, you can use this chart at home to monitor your vision. But using the chart doesn't mean you should skip annual visits to your eye doctor, because you can easily miss signs that only a trained eye care practitioner will find. The chart below is an approximation of the printed chart used by eye doctors. For more accurate detection of macular damage, you will need a comprehensive eye exam. If you would like to have a copy of this chart, please open this PDF file and select "print." 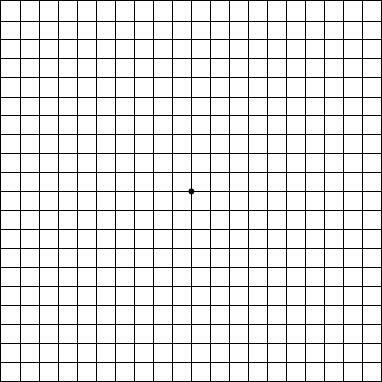 For more information on amsler grids visit AllAboutVision.com.